China's northern municipality of Tianjin will restrict traffic and issue new car license plates via bidding and lottery in a drive to fight traffic jam and air pollution. 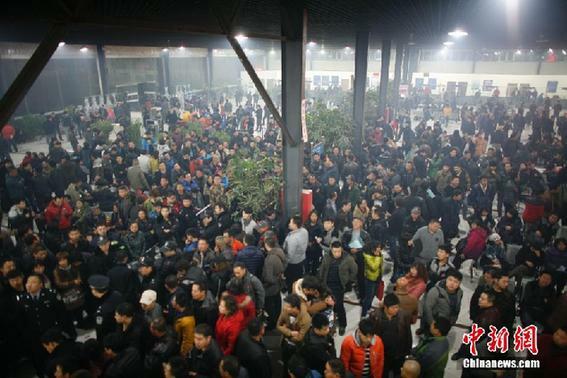 Customers flock to a second-hand car market in Tianjin on Sunday night. The city will impose quota on its new car plates starting on Monday, requiring buyers to join lottery or bid in auctions to win a plate, according to a notice issued by the city government on Sunday evening. The notice did not give details on the quota or how many plates will go for lottery compared with auction. Tianjin will also follow Beijing's step in adopting a similar traffic restriction scheme, which blocks cars from streets depending on the last digit of their plates, with two numbers banned each workday, said Miao Hongwei, head of the city's traffic management bureau. The ban, which will take effect on March 1, is expected to take one fifth of the city's private cars off the road on workdays. Moreover, the city will ban vehicles with non-local plates from driving into the city's outer ring road during morning and evening rush hours on workdays, Miao said. A statement by the municipal government said the move was part of the city's effort to curb its ballooning car ownership, reduce traffic jams and fight smog. Tianjin has registered 2.36 million motor vehicles by 2012, up from 1.2 mln in 2006, while the average driving speed on downtown roads during rush hours dropped to 19.5 kilometers per hour in 2011, indicating severe traffic gridlock in the city of 14 mln permanent residents. Meanwhile, vehicle emissions have been held as a key source of the persistent smog plaguing Tianjin, its neighbor Beijing and other cities in the northern region. Previously, Beijing, Shanghai and Guangzhou have limited the number of vehicles registered each year. Shanghai uses a bidding scheme, while Beijing issues plates through a lottery. Guangzhou adopts both systems, half issued through bidding, the other half through a lottery.